Today was a reality TV kind of day. I caught up on the most recent 3 episodes of The Amazing Race then took on tonight’s 2 hour Voice episode (note: 3 hours a week is too much, that’s Idol-like self importance, cut back NBC, cut back). All four were great episodes (specifically The Voice), but I came away desperate to sing the praises of a handful of personalities like none other. I don’t cry at sad things very often. I barely shed a tear watching Titanic in re-release but I bawled the entire way through the amazing documentary Being Elmo– literally, the kids in the theatre all thought I was nuts-there’s something about love and goodness and selflessness that just breaks me down. Those qualities had me close to tears during The Amazing Race and The Voice, of all things, this week. First was The Amazing Race in which my favourite team, best friends from Kentucky Bopper & Mark, first rose to the top of the heap for their first win of the season then sank to the bottom to narrowly escape elimination (for a second time!) as “the last team to arrive”. Bopper and Mark are always funny, optimistic and generally a hoot to watch, but these past few episodes have made all the more clear one of the big points of the season- good guys prosper. They may not win, but Bopper and Mark have fallen behind on non-elimination legs twice now and are still racing. In a season with more whiners, jerks and brats than almost any other, Bopper and Mark’s unlimited support of each other and patience and consideration for the other racers is immeasurable. Dave, Ralph and Brendon are macho and controlling; Rachel and Vanessa are defeatist, emotional and just plain bitchy (more Vanessa than Rachel on that one, she’s a nightmare! ); the other Rachel is so defensive that her husband Dave literally had to say “don’t misconstrue my support as yelling” because she ALWAYS thinks he’s yelling… which he sometimes is. A few standup moves early on (like sharing money with Bopper and joining forces with Rachel and Dave) combined with Art & JJ’s sheer speed to make them favourites, but every week they show darker and darker colours with their arbitrary hatred of the Big Brother team, misguided slightly misogynistic comments and, most notably, their complete freeze-out of Rachel and Dave for the crime of not U-turning another team just because they don’t like them very much. That leaves Bopper & Mark, a team who would be notable even in a better season. They have some backwards Kentucky traces that show up every once in awhile, but how anyone could not like these guys is beyond me. Bopper’s running on a bum knee and Mark gets sick every time they step into a vehicle, but they’re pushing through “for their kids”. But perseverance only gets you so far in my estimation, it was when Bopper was willing to give up the race, without a second thought, because he’d “rather have [his] buddy] (thinking Mark’s health was in danger during a Bollywood roadblock) that I declared them my favourite team since Nick & Star. Bopper & Mark are smarter than they seem, perfect teammates and never take themselves too seriously- what could be better? But as much as I love my “Team Kentucky”, I’m completely head over heels for “The Comeback Kid”. Team Cee Lo is so good this year that I think his remaining 3 competitors could all beat every other singer still on The Voice (except maybe Team Blake’s Erin, she could take out Chessa). But there’s no one quite like Jamar. He’s a knock-your-socks-off performer, there’s no doubt about that. He’s got a killer voice, good instincts, great song choice and the perfect mentor (Cee Lo has grown on me IMMENSELY since the Live shows began- he’s a great coach, if a lousy judge). 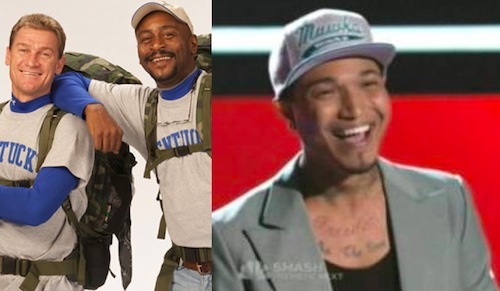 Jamar’s also cute as a button (if you can ignore his idiotic tattoos) with the warmest smile on TV. But honestly he could have a voice like Erin Martin (the great Voice travesty of the season) and I’d still be completely obsessed with Jamar. He’s got the attitude of an angel with the backstory of a Lori-Parks character. He’s an HIV positive former addict who was convinced he’d never live to see 30. His 30th birthday recently behind him, Jamar is 6 years sober and one of the most inspirational people I’ve ever seen. It’s almost impossible to imagine the sunny, optimistic, kind, faithful, determined young man sinking to rock bottom but it’s easy to see how he was able to pull himself back up. Jamar’s attitude is literally unparalleled. If everyone were even just a little bit more like Jamar Rogers, just think how much better off we could all be. Reality TV is known for hothead housewives who flip over restaurant tables, delusional would-be American Idols and contests where people in bikinis transport butter onto a giant tub of popcorn using only their mostly naked bodies (an actual Big Brother competition… unfortunately). Because of all that, we sometimes forget that if you capture enough “reality”, at some point there’s gonna be someone worth watching. Bopper, Mark and Jamar are those people.